Protestors demonstrate in front of Germany's Federal Administrative Court in Leipzig prior to Tuesday's ruling. The placards read: "Health risk." 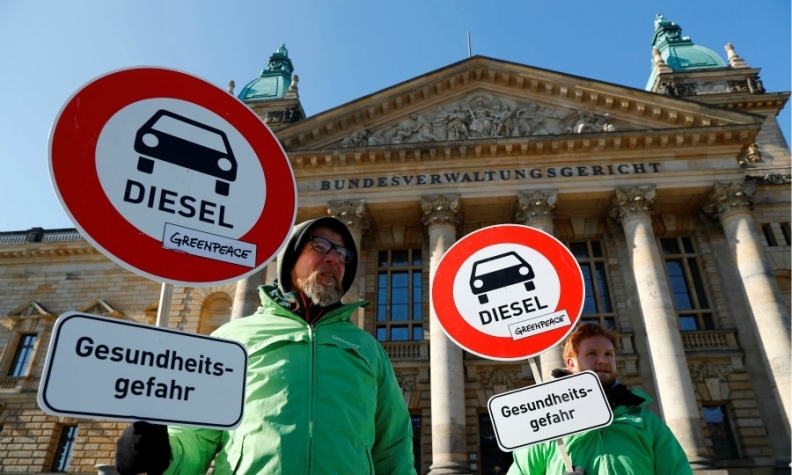 LEIPZIG, Germany -- A top German court ruled on Tuesday in favor of allowing major cities to ban heavily polluting diesel cars, a move likely to hit the value of 12 million vehicles in Europe's largest market and force automakers to pay for costly modifications. There has been a global backlash against diesels since Volkswagen Group admitted in 2015 to cheating U.S. emissions tests, meant to limit emissions of particulate matter and nitrogen oxide (NOx), known to cause respiratory disease. "This is a groundbreaking ruling, and one which we expect has set a strong precedent for similar action across Europe," Evercore ISI analyst Arndt Ellinghorst said in a note to investors. While other countries are also considering restrictions on diesel cars, a ban Germany is a new blow for the car industry, and an embarrassment for Chancellor Angela Merkel's government, which opposes bans. The ruling by the country's highest federal administrative court came after German states had appealed against bans imposed by local courts in Stuttgart and Duesseldorf in cases brought by environmental group DUH over poor air quality. Merkel's government, which has come under fire for its close ties to the car industry, had lobbied against a ban, fearing it could anger millions of drivers and disrupt traffic in cities, with public transport not in a position to take up the slack. The court on Tuesday rejected the appeals by the state governments and ordered Stuttgart and Duesseldorf to amend their anti-pollution plans, saying that city bans can be implemented even without nationwide rules. "This is a great day for clean air in Germany," DUH managing director Juergen Resch said. The DUH sued Stuttgart and Duesseldorf to force them to implement driving bans, after about 70 German cities were found to exceed European Union NOx limits. Sales of diesel cars have been falling fast in Europe since the VW scandal, with fears of driving bans sending demand sharply down in Germany in the last year. Paris, Madrid, Mexico City and Athens have said they plan to ban diesel vehicles from city centers by 2025, while the mayor of Copenhagen wants to ban new diesel cars from entering the city as soon as next year. The share of diesel cars in overall vehicle production in Europe could be cut to 27 percent by 2025 from 52 percent in 2015, Barclays forecasts. Germany's government and the auto industry have been seeking to avert driving bans. Automakers have pledged to overhaul software on 5.3 million diesel cars and are offering trade-in incentives for older models to help improve air quality. But environmental groups have lobbied for costly improvements to exhaust cleaning systems for cars with Euro 6 and Euro 5 emissions standards, costing at least 1,500 euros ($1,861) per vehicle..
"Once it is clear there will be driving bans the car industry will end its resistance against technical upgrades," DUH's Resch earlier told public broadcaster Bayern 2. The government has begun work on legal changes to permit driving bans on certain routes on an emergency basis, transport ministry documents seen by Reuters showed. It is also considering making public transport free in cities suffering from poor air quality. Cities will probably target diesel models with older emission controls. Of the 15 million diesel cars on Germany's roads, only 2.7 million have the latest Euro-6 technology, data by the KBA motor vehicle watchdog showed. Retrofits would cost billions of euros and an outright ban could slash resale prices, which are used to price leasing and finance contracts. German auto safety group ADAC said automakers should bear any costs of upgrading old diesel models.